The Mobile Column, a crowd favourite whenever it is featured, will be the highlight again in this year’s NDP. This year, there will be more than 200 vehicles featuring the SAF’s 3 Generation capabilities and Home Team’s assets. It will roll pass City Hall and into the heartlands. 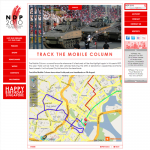 Covexis, together with map partner Tele Atlas, is proud to sponsor the tracking of the mobile column for NDP 2010 and also featuring our new Mosaic web map service.